A new year has officially kicked off, shoppers, and it’s looking like one that will, once again, be marked by unimpressive economic growth. That’s not great news for retailers. Or, at least, most retailers. Dollar stores, on the other hand, appear to be doing better than ever. I blogged about the dollar store phenomenon back in October 2010 (Taking over the world, one dollar at a time), and well over a year later, this discount segment of the retail business simply seems to continue gaining momentum. Everything for a Dollar Store, a chain with about 80 locations across the country, recently opened two new GTA stores: one in North York Sheridan Mall and one at Cloverdale Mall in Etobicoke. It’s planning additional Toronto-area stores for the year ahead, along with a slew of other new ones across the country. Other dollar store chains are experiencing similar success, regularly opening new stores and coping with impressively (or, for customers, frustratingly) long lines at existing stores. The appeal of these stores is hardly surprising. Just yesterday, I ventured out to Shoppers Drug Mart only to find that the product I needed cost $4.29 – substantially more than I remember paying for the same product a couple months ago. Since I was in the mood for a little comparison shopping, I stopped by Dollarama before making my purchase, and sure enough, I found the same product (in a different brand) for exactly $1.00. I continue to be baffled at how these companies turn enough of a profit to fuel such impressive growth when their prices are so substantially below those of other retailers. However they do it, it certainly seems to be working. And as long as the economy continues to struggle, I suspect dollar stores will continue to enjoy booming growth in business. I’ve been spending a lot of time in dollar stores lately. Every year around this time, as part of my quest to piece together a Halloween costume without spending a fortune on a pre-packaged outfit that I’ll wear just once, I tend to frequent these discount shops. I’m always amazed at what I find. For a dollar, or two at the most, you can get just about anything. Makeup and beauty products, dishes and kitchen utensils, household products, toys, greeting cards, gift wrap, costume jewellery and even clothes fill the shelves of these stores. While these products may not be of high quality – to say the least – it still baffles me that dollar stores can sell them at such incredibly low prices. These stores must be keeping their costs at an absolute bare minimum to be generating any sort of slim profit. And yet the concept seems to do well, with new dollar stores continuing to emerge around the GTA. 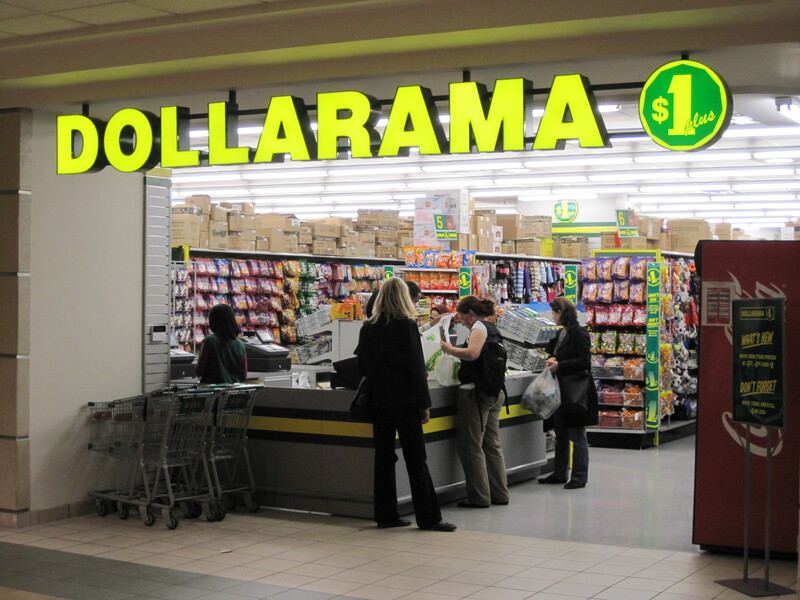 Dollarama's newest location at the Sheppard Centre in North York. A new Dollarama location opened last week in the Sheppard Centre, bringing the chain’s total store count to more than 600 locations across the country. Your Dollar Store with More Inc., which has more than 140 locations, opened the country’s largest dollar store this month. Located in the Golden Mile Shopping Centre in Scarborough, the store is 25,000 square feet – only slightly smaller than an average Metro grocery store, which is 32,700 square feet in size. That’s an awful lot of space to fill with items that cost a loonie. More stores are on the way. Earlier this month, U.S. dollar store chain Dollar Tree, Inc. bought Vancouver-based Dollar Giant Store (B.C.) 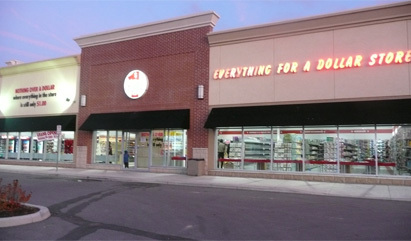 Ltd., which operates 85 stores in B.C., Alberta, Saskatchewan and Ontario. The new owner appears set to expand aggressively, with plans for at least 50 new stores next year. As a business model that brings in revenue $1 at a time, that’s pretty impressive growth. Maybe it’s the frugal mentality brought on by the recession that’s prompted this sudden boom in the dollar store business. But will there really be enough demand for discount merchandise to sustain hundreds more of these stores in Canada? I suppose as long as there’s an appetite for cheap loot, there will always be some sort of market for dollar stores. I may not be their number one customer, but come October, they can certainly count on my business. 1. Dollarama at Square One Shopping Centre in Mississauga. This HUGE dollar store has items you would never have guessed could possibly cost a dollar, and more. The selection of merchandise is impressive. 2. Your Dollar Store with More at 5095 Yonge Street in North York. While not as large as my first choice, this store crams an awful lot of merchandise into the limited space that it has. It also carries certain items that cost more than $1 or $2, but which are still extremely cheap compared to other retailers.